Except one here, one there. There’s one such here and there. God finds one here and there. They’re few; one here, one there! “Ye are a chosen generation, a royal priesthood, a holy nation, a peculiar people; that ye should shew forth the praises of him who hath called you out of darkness into his marvelous light: which in time past were not a people, but are now the people of God.”—1 Pet. 2:9,10. This Kingdom is an ecclesiastical Kingdom—a Church-Kingdom; but even if we look amongst the numerous church-kingdoms which have sprung up in the world (each of which claims to be the kingdom of God’s dear Son), we find that this “holy nation” or Kingdom is none of these. It is not the Roman Catholic church or ecclesiastical kingdom, nor the Greek church, nor the Armenian, nor the church of England, nor the Methodist church, nor the Lutheran, nor the Presbyterian, nor the Baptist, nor the Congregationalist. These all may have amongst their millions some members of this “little flock,” this “holy nation,” this true Kingdom class which the Lord is selecting; but none of these institutions is the Lord’s Kingdom; none of them contains all who are his. There is only one record in the universe that enrolls all the members of this “holy nation” or Kingdom: it is called, “The Lamb’s Book of Life.” Hence, if we examine church history, we shall no more find this “holy nation,” this holy ecclesiastical Kingdom, than amongst the temporal kingdoms. The historians knew not of the true “holy nation:” they saw and knew and recounted the incidents of the human organizations, called “Christ’s kingdoms,” but they knew nothing of the true one. Although it has existed from the day of Pentecost to the present time, it has always been the kingdom of heaven suffering violence—despised and rejected of men, insignificant and ignored in the sight of the world.—Matt. 11:12. The reason for this is that it is a “peculiar people”—not peculiar in dress, nor in manners, nor in language, nor in foolish, senseless forms and idiosyncrasies; but peculiar in that it is separate from the world and the spirit of the world. It has the spirit of Christ—a spirit of full consecration to the Lord, and separateness from the world and its selfish aims. It is peculiar in its adherence to the Word of the Lord as its only law. It is peculiar in that it rejects worldly wisdom when it conflicts with the divine revelation. It is peculiar in that it is in the world, but not of the world. It is peculiar in that it has a decided faith and acts in harmony with its faith, and with zeal. It is peculiar in that it is self-sacrificing and knows no will but the will of its King. It is peculiar in that it knows the truth and is able to give a reason for the hope within, while others merely speculate and wonder and doubt. The King, when establishing this Kingdom, forewarned all who would be of it that, in proportion as they possessed his character and his truth, and were thus “children of the light,” and likenesses of himself, who was “the Light of the world,”—in that proportion they would have the enmity of the world and the opposition of the flesh and the devil to withstand and overcome. In view of his forewarnings, “Marvel not if the world hate you, ye know that it hated me before it hated you;” “If ye were of the world, the world would love its own, but now ye are not of the world; because I have chosen you out of the world, therefore the world hateth you;” “Whosoever will live godly in Christ Jesus shall suffer persecution;” in view of these admonitions it should not surprise us that the nations of the world (political and ecclesiastical kingdoms) have always hated and persecuted the individuals composing this “holy nation.” They seem to realize an antagonism, however little it may be expressed. This “holy nation” looks to a higher King and higher laws than any by which others are governed, and as Herod sought to destroy “him who was born king of the Jews,” so the various worldly nations have sought (under the influence of the prince of this world) to hinder the development of this holy nation as antagonistic to their systems. 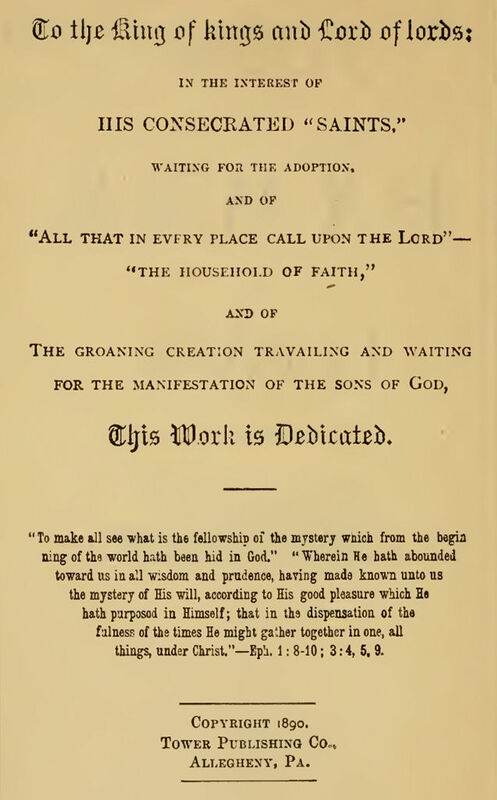 Nevertheless, we note the care with which the apostles pointed out that all who compose this holy nation shall, so far as possible, “live peaceably with all men”—avoiding strife and contentions, except where principles are involved; and even when contending “earnestly for the faith once delivered to the saints,” to manifest the spirit of meekness and patient forbearance, that “whereas they speak against you as evildoers, they may by your good works which they shall behold, glorify God in the day of visitation.” He urges, therefore, all of the holy nation, saying, “Submit yourselves to every ordinance of man for the Lord’s sake:…For so is the will of God, that with well-doing ye may put to silence the ignorance of foolish men: As free, and not using your liberty for a cloak of maliciousness, but as servants of God….For this is thankworthy, if a man for conscience toward God endure grief, suffering wrongfully….For even hereunto were ye called: because Christ also suffered for us, leaving us an example, that ye should follow his steps; who did no sin, neither was guile found in his mouth; who, when he was reviled, reviled not again; when he suffered, he threatened not; but committed himself to him that judgeth righteously.”—1 Pet. 2:13-23. But we notice further the Apostle’s statement that this “holy nation” or Kingdom is also a “royal priesthood.” We look amongst the priesthoods of earth, but we find that the priestly office is distinctly kept separate from the kingly office, everywhere. Indeed, they are generally antagonistic. The kings and royal families usually represent the highest developments of ambition and self-gratification: the priests of earth, theoretically at least, present sacrifices, and thus seek to make atonement for sins. Priests do not exercise kingly authority, nor kings condescend to priestly services. But in this “peculiar people” the priesthood and kingship are united. It was so with the King himself,—as a priest he offered up his own life, unselfishly, for the redemption and blessing of others. As a King he still has the same unselfish character and will use his kingly office to carry forward to all mankind, and make available to all, the blessings, liberties and privileges purchased with his own precious blood. His reign will be for this very purpose;—and for the establishment of righteousness and the extirpation of evil and those who adhere to it. The King himself is the great High priest of this “peculiar people,” this “holy nation,” this “royal priesthood;” and it is required of each individual member of this “holy nation” that he shall be a priest; that he shall be a sacrificer; that he shall partake so much of the loving and generous disposition of the King that he will desire to do good unto all men, as he may have opportunity, especially to “the household of faith;” and that he shall lay down his life for the brethren—in the service of the truth, in their interest. In these and all respects they must all be conformed to the image of God’s dear Son.—Rom. 8:29. This experience as sacrificers in this present time as sufferers for righteousness’ sake, as tempted and tried and able to sympathize with the weak and the erring, is a necessary part of the educational discipline which must be undergone by this priesthood before they are accounted ready to enter the honors and powers of their divine kingdom, as representatives and associates of the King of kings and Lord of lords. Nor does their priesthood end when their kingly powers begin, for it is written concerning their future reign,—“Thou hast made us unto our God kings and priests, and we shall reign on the earth.” (Rev. 5:10,11.) This “peculiar people,” this “holy kingdom” or nation all of whom are “royal” priests, has a great work to do when established in the kingdom power; for it is none other than the promised “Seed of Abraham,” which, according to the divine promise, is to have entrusted to it the great work of blessing all the families of the earth, by bringing them to the knowledge of the Lord, and into harmony, if they will, with the New Covenant sealed by the precious blood of the King. As explained by the Apostle Paul (Gal. 3:16,29), the King himself is the head of this “seed,” this “peculiar people,” this “royal priesthood;” and they are reckonedly members of his body, and with him they complete this holy seed to which is committed the work of blessing.—Rom. 11:31. The Apostle notes still another distinctive feature pertaining to this “peculiar people,” saying that it is a “chosen generation” or race. How strange it would at first seem that the Apostle should speak of this peculiar people, gathered out from amongst various races, Jews and Gentiles, as being a special, particularly chosen race: as though they were a different family entirely from the remainder of mankind. If tribal relationship be understood, is not this “peculiar people” a mixture of all the races? And if all humanity be considered, are not these “peculiar people” of the same race as the remainder of mankind? Ah, no! they are a new race, a race separate and distinct from all others. True, they once were of the same race, and some belonged to one branch or family and some to another; but their King, in calling them to be this “holy nation,” set aside entirely their previous genealogy and started them as a new race. As members of the Adamic race they were already slaves of sin and under condemnation of death; but their Master and King, who redeemed them from sin and death, opened the way for a full completion of the great divine purpose, and they were begotten again, not of blood, nor of the will of the flesh, nor of the will of man, but of God. (John 1:13; 1 Pet. 1:3.) They are therefore “new creatures” in Christ Jesus. (Gal. 6:15.) To them old things have passed away, and all things have become new.—2 Cor. 5:17. The apostle therefore was right in his declaration that these are a different generation or race from others of mankind. He was right also in speaking of them as a “chosen generation”—the race which God himself is selecting for the accomplishment of his great and wonderful plan, first declared to Abraham, but not understood, and expected to be fulfilled in Abraham’s literal posterity. In reality this salvation “began to be preached by our Lord, and was confirmed unto us by them that heard him.” (Heb. 2:3.) True, God has certain provisions and blessings in reservation for the natural seed of Abraham, and let us remember that to them also came the first opportunity, and the first place, in this new, select, spiritual race or “chosen generation.” The Head or Chief of this chosen race, the twelve subordinate chiefs, the apostles, and many of the other members of this “holy nation” came from the literal seed of Abraham; but as a whole the natural seed was not worthy to become the “chosen race” or generation; but only to as many of them as received him (Christ), to them gave he liberty to become the “sons of God,”—by regeneration.—John 1:11,12. Grasping the full statement of the Apostle with reference to this peculiar people, this holy nation, this new or regenerated race, this royal priesthood, we can see readily that none of the human systems or organizations of earth, past or present, fit these demands. But we can see also that the conditions are well fulfilled in a “little flock” of which we may find scattered members here and there to-day, and all the way back to Pentecost. They are all self-sacrificing priests, who serve the living God through Christ Jesus acceptably, by serving one another, and all men as they have opportunity, and in general serving the gospel. Fully consecrated to God, and their imperfections (unintentional) all covered by the merit of the Redeemer, they are indeed a “holy nation,” with higher and different aims from those of the world, and with a different spirit, they are indeed a peculiar people. And the royalty of their priesthood, although unknown to the world at present, shall be revealed in due time; for it is declared by the inspired Word, that “the whole creation groaneth and travaileth in pain together until now,” “waiting for the manifestation of the sons of God.”—Rom. 8:19,22. When the glory of these sons of God, this chosen race, this royal priesthood, shall be revealed in the establishment of the Messianic Kingdom, during the Millennium, the entire groaning creation—the whole race of Adam, condemned in Eden, but ransomed at Calvary—shall be blessed by this great “Seed of Abraham.” Instead of their groanings they may have joy and peace, through accepting the blessed arrangements of the New Covenant; and as a result, by the close of the Millennial age, all who will may have experienced the blessings of the divine promise, “God shall wipe away tears from off all faces and turn away the reproach for being his people.” Then shall be brought to pass the saying which is written, He that sat upon the throne said, “Behold, I make all things new; and God shall wipe away all tears from their eyes; and there shall be no more death, neither sorrow nor crying, neither shall there be any more pain: for the former things are passed away.”—Rev. 21:4,5. Is it any wonder that the Apostle declares that each and all of these “peculiar people” should make it the first, the chief, practically the only business of life, “to show forth the praises [the virtues of character and plan] of him who hath called you out of darkness into his marvelous light?” And the showing or the telling of these is the preaching of the gospel, whether it be done in public or in private, by word of mouth or by printed page. And this, the chief business of the peculiar people, begun now, will continue to be their business throughout the future, tho under more favorable circumstances, in the majesty of the Kingdom, with power to enforce the wise and just and wholesome laws, and with love and mercy to help and to succor the weak and the erring, and gradually to restore them, if they will, to all that was lost in Adam.